Lumbar spinal stenosis is a frequent indication for spinal surgery. The predictive quality of treadmill testing and MRI for diagnostic verification is not yet clearly defined. 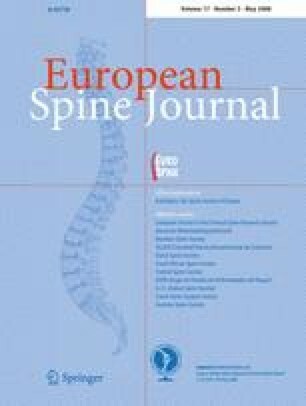 Aim of the current study was to assess correlations between treadmill testing and MRI findings in the lumbar spine. Twenty-five patients with lumbar spinal stenosis were prospectively examined. Treadmill tests were performed and the area of the dural sac and neuroforamina was examined with MRI for the narrowest spinal segment. VAS and ODI were used for clinical assessment. The median age of the patients was 67 years. In the narrowest spinal segment the median area of the dural sac was 91 mm2. The median ODI was 66 per cent. The median walking distance in the treadmill test was 70 m. The distance reached in the treadmill test correlated with the area of the dural sac (Spearman’s ρ = 0.53) and ODI (ρ = −0.51), but not with the area of the neuroforamina and VAS. The distance reached in the treadmill test predicts the grade of stenosis in MRI but has a limited diagnostic importance for the level of clinical symptoms in lumbar spinal stenosis.